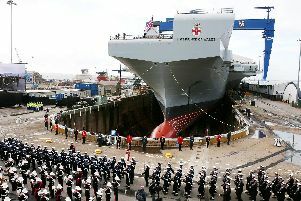 HUNDREDS of Japanese sailors will visit Portsmouth next week when the Royal Navy plays host to three warships. The ships belong to the Japanese Maritime Self-Defence Force Training Squadron and are visiting as part of a five-month global deployment. The squadron is made up of training ship JDS Kashima and two destroyers, JDS Shirayuki and JDS Isoyuki, and includes 180 cadets. After anchoring in the Solent on Sunday, they will enter the naval base on Monday. JDS Kashima will fire a 21-gun salute as she passes Southsea at around 10.30am. And next week, JDS Isoyuki will be open to visitors. Commander Jeff Short, who is helping arrange the visit, said: ‘The Royal Navy has a lot in common with the Japanese Maritime Self-Defence Force. ‘We have engaged as maritime nations since 1613 and exchanged students for the last 150 years. ‘More recently, we have worked together on counter-piracy operations in the Indian Ocean and we share common equipment such as the Merlin helicopter. Once alongside, the cadets and sailors will see the navy’s renowned marine and air engineering facilities at HMS Sultan in Gosport. They will also see the operations room and bridge simulators at HMS Collingwood in Fareham. A bit of Royal Navy history is also on the cards for the visitors, with trips to the Naval Historical Branch and Portsmouth’s Historic Dockyard. Meanwhile, senior officers from the squadron will call on the Lord Mayor of Portsmouth, Councillor Lynne Stagg, at the city’s civic offices. Members of the public can go on board JDS Isoyuki between 10am and 4pm on July 24. The squadron’s embarked 40-strong military band will be performing on the same day next to HMS Victory between 12.30pm and 1.30pm. The squadron, which last visited Portsmouth in 2008, leaves at 9am on July 25.